Semiconductor technologies are moving at such a fast pace that new materials are needed in all types of application. Manipulating the materials and their properties at atomic dimensions has become a must. This book presents the case of interlayer dielectrics materials whilst considering these challenges. 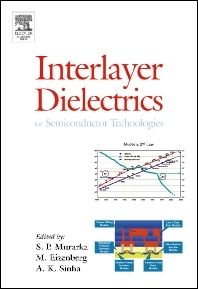 Interlayer Dielectrics for Semiconductor Technologies cover the science, properties and applications of dielectrics, their preparation, patterning, reliability and characterisation, followed by the discussion of different materials including those with high dielctric constants and those useful for waveguide applications in optical communications on the chip and the package. Provides an up-to-date starting point in this young research field. Materials Scientists, researchers and professionals with semiconductor technologies.